New presentations: Fonte Nova from 1951 to 2013! The old stadium had seen some great games of 100,000+ spectators, but it was also the place of a tragic accident in 2007. Closed right afterwards it is now completely rebuilt and again able to hold beautiful football. First game tomorrow! When built in 1951, it was the largest stadium of the entire Bahia state. Like most venues built at that time in Brazil, it had elliptical stands. Initially only the lower section of stands was done. One thing that made it distinctive was the open space giving fans a magnificent view on the Salvador lagoon Dique do Tororó, part of the country’s natural heritage. Being the largest around, the stadium played host to numerous great games. Most of them were those by EC Bahia and Vitória, two local powerhouses with large fanbases. The “Ba-Vi” derby between them was held here over 300 times (! ), getting crowds of nearly 100,000 on occasions. The stadium was also the site of a tragedy in 2007. On November 25 the stands were packed to capacity as the hosts celebrated promotion and one step of the stands didn’t withstand the weight of supporters. Unfortunately, as it was almost on top of the terraces, 7 people fell down onto the sidewalk around the stadium, dying instantly. After that incident the stadium was closed definitely and already the next day decision was made to demolish it. However, works only began in 2010 with lower stands being taken down with machinery, while the remainder with explosives. In September 2010, in the place of former Estádio Fonte Nova (meaning ‘new source’ and associating the stadium with nearby lagoon) construction of a completely new stadium began. Just like its predecessor, the new stadium received stands opened to the south, allowing fans to enjoy the beautiful lagoon view. Stands are blue as well, this time thanks to colour of 55,000 seats rather than paintwork on the concrete, though. 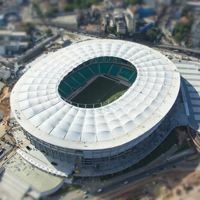 Along the concept of German Schulitz Architektur and its Brazilian partners, the stadium received light roof covered with membrane, stands divided into three tiers and the open end was thought to be a good location for concert stage on non-sporting occasions. The stadium project was launched thanks to Brazil winning the 2014 World Cup host selection and this is the very first new stadium opened ahead of the event (third, if we include existing stadia that went through an overhaul). Complete cost of the project stood at R$ 592 million (some €227 million / $294 million). The ceremonial opening of the stadium took place on April 5 with president Dilma Rousseff kicking the ball with her bare foot. However, first large event was held on April 7, with the famous ‘Ba-Vi’ derby of Salvador.